CIBJO President Gaetano Cavalieri (standing, fourth from right) joins Thailand’s Minister of Commerce, Apiradi Tantraporn (standing, third from left), DITP Director General Malee Choklumlerd (standing, fourth from left), and Dr. Pornsawat Wathanakul, Director of GIT, the Gem and Jewelry Institute of Thailand (standing, second from left), at an impromptu press conference after the dinner summit in Bangkok on August 8. 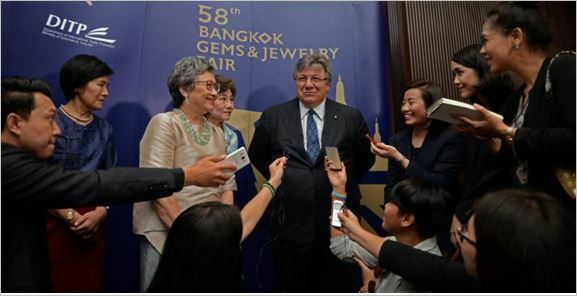 CIBJO President Gaetano Cavalieri has proposed that Thailand position itself as the primary access point to the gemstone and jewellery industries and markets of the ASEAN bloc in Southeast Asia, serving as a centre that connects and services the entire region, and also acting as a bridge-way that links it to the world. He was the keynote speaker at a dinner summit held in Bangkok on August 8, organised by the country’s Department of Trade Promotion (DITP), which brought together senior government and industry representatives to consider strategies for consolidating Thailand’s leadership role in the business. DITP, which is the department within Thailand’s Ministry of Commerce responsible for promoting the country’s export industries, has recently expanded its involvement in the critically important gemstone and jewellery industry, taking over the management of the Bangkok Gems and Jewellery Fair. Its summit in this week was presided over by Apiradi Tantraporn, the Minister of Commerce, who was joined by the DITP Director General, Malee Choklumlerd. Reviewing the position of Thailand in the gemstone and jewellery business, Dr Cavalieri noted that, while it undoubtedly has achieved the status of a world leader, seeing its exports grow over the past 10 years by almost 300 percent to about $11 billion, and peaking in 2012 at $13.1 billion, it is not always considered way internationally. CIBJO President Gaetano Cavalieri addressing the DITP dinner summit in Bangkok. „Thailand’s second-tier status as a centre has less to with production and sales capacity than it has to do with way that it is perceived in the business,“ he said. „But perception is critical, for the way you are perceived by others affects your ability to market your products, and consequently is a principal factor in deciding whether you will be able to optimise sales and exports. „Besides being a rich source of gemstones and pearls, and home to a group of fast-growing gemstone and jewellery industries, it is a region with a population of than 600 million people, which is larger than those in the European Union or North America, and it has the third-largest labour force in the world, behind China and India,“ he explained. For Thailand, the status of the primary ASEAN gem and jewellery centre could be an irresistible USP, Dr Cavalieri stressed. Dr Cavalieri expressed his admiration for the commitment being shown by the Thai government and DITP to strengthen the position of the country’s gemstone and jewellery industry, which today accounts for 5.13 percent of the country’s exports. In particular, he expressed his support for the Bangkok Gems and Jewellery Fair, which will be held for the 58th time this September, and suggested that it too become recognized as the ASEAN trade show. CIBJO is the international jewellery confederation of national trade organisations. CIBJO’s purpose is to encourage harmonisation, promote international cooperation in the jewellery industry and to consider issues which concern the trade worldwide. CIBJO’s chief mission is to protect consumer confidence in the industry. Click here to visit the CIBJO website for more information.